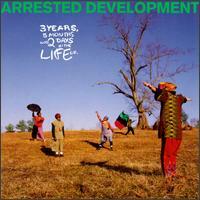 Arrested Development was a Atlanta-based collective by way of Milwaukee, which (originally) included Headliner (the group deejay), Aerle Taree, Montsho Eshe, Rasa Don, Baba Oje, and the front man and voice of the crew, Speech. Speech and Headliner, who were best friends, formed the group in ’88 as a positive alternative to the gun-totting thuggery that begin to consume hip-hop in the early nineties. After 3 years, 5 months and 2 days of trying to get a record deal, AD inked a deal with Chrysalis, thus the name of the album. 3 Years 5 Months & 2 Days in the Life of… was produced entirely by Speech and released in early ’92. 3 Years was a massive commercial success as it would move more than 4 millions units, donning some of the biggest pop hits of the nineties, and earned the collective two Grammy’s in ’93 for Best New Artist and Best Rap Performance By a Duo or Group (we’ll get to that a little later on). AD would release an MTV Unplugged album in early ’93, which would earn the collective a gold plague. By ’94 when they returned with their official sophomore effort Zingalamaduni, their 15 minutes of fame had expired, as the album was a commercial failure, the group would soon disintegrate and AD was a thing for the history books. Temporarily. They would later reunite, making quite a few changes in the roster (including the departure of the co-founder Headliner) and release several independent projects. Speech would also release a slew of independent solo albums (with the exception of his first solo album, which was released on Chrysalis in ’96) but he and the group were never able to recapture the commercial magic they found in the early nineties. I haven’t listened to 3 Years in over 10 years, and honestly, I’m probably more familiar with their live Unplugged album then the original. I don’t remember being crazy about this album but maybe time as been kind to 3 Years. Man’s Final Frontier – Intro. Mama’s Always On Stage – Speech hooks up an up-tempo bluesy instrumental that he uses to show appreciation for all the black mothers who hold it down for their children, and fires a shot at all the dead beat dad’s as well. This was solid. I enjoyed the nasty harmonica sample laced throughout the song. People Everyday – I believe this was the third single released from 3 Years. Over a mediocre instrumental and a chorus that borrows from the Sly and The Family Stone’s record with the same title, Speech spins a tale about a relaxing afternoon with his girl that turns violent when some brothers attempt to disrespect his black queen. The remix, which was actually used on the video and single version, uses an acoustic guitar which gives the song a different feel and sounds so much better behind Speech’s storyline. Mr. Wendal – This was the 2nd single released from 3 Years. Speech discusses the life of a homeless man (or as Speech refers to him as, a bum) that he calls Mr. Wendal. Over the course of two verses he uses the life of Mr. Wendel to remind the listener to be thankful, that one man’s floor is another man’s ceiling, and that we all need to do a little self-evaluation from time to time to keep in perspective what’s most important in this short life we live. Back in the day I didn’t really care much for this one, mainly because of the instrumental that came across as cheesy. Twenty years later the instrumental doesn’t sound as bad and Speech’s content is pretty well thought out. Children Play With Earth – In a slightly distorted voice Speech opens this one up telling African (African-American) kids to stop acting like European kids and put down the Nintendo (today that would be the PS4 or Xbox) remote, unplug the tv and go outside and play in the dirt. It’s kind of comical that he refers to two devices made in Asian countries as a “European thing”, but I get his point. After an extended instrumental break and a chant of “dig your hands in the dirt, children play with earth”, Speech then returns in his distorted vocal to finish up his spoken word piece in an attempt to get kids motivated to become acquainted with nature. I think this song speaks both literally and figuratively as a wake of call to the black youth to not only get off their asses and outside away from technology but also a call to snap out of the brainwashed state the black youth were and still are in. Cleverly done, Speech. Raining Revolution – Over a slightly depressing instrumental Speech speaks about the impending revolution, but he never makes it clear as to what revolution is coming, so you can choose and apply any meaning you want, I guess. Not, a terrible song, but I’m sure it’s nobodies favorite either. Fishin’ 4 Religion – Over a decent up-tempo instrumental Speech criticizes the black church for teaching faith but not teaching the people to act on their faith to help change their condition. Preach! Overall, the song was so-so. Give A Man A Fish – I didn’t like this one. U – This one starts out with Aerle Taree speaking about marriage over some funky piano keys. Then the same piano sample is sped up a bit, giving it a zany feel, and Speech commences to rhyme sing about finding the woman of his dreams, getting marriage and building a family. Some may find this song corny but I dug the message in the song and found the instrumental interesting. Natural – Over deep guitar licks and two piano key strokes over the chorus, Speech speaks about meeting the perfect natural woman. Full of intellect, conversation and free of fake hair, lips, and other body parts, so he obviously didn’t meet her in California. This could be the companion piece to India Arie’s “Video” record. Decent. Dawn Of The Dreads – Easily my least favorite song on 3 Years. Tennessee – This was the Grammy winning monster first single that put Arrested Development on the map and helped catapult 3 Years sells to quadruple platinum status. Over rough and heavy drums, in his signature singy (new word) vocal, Speech wearily converses with God seeking his guidance, that eventually lands him in Tennessee where he revisits the disgraceful and proud past of his southern ancestors. But I’m still thirsty. If King David was a head this is probably what one of his Psalm would have sounded like. Classic. Washed Away – Over an interestingly awkward low-key instrumental, Speech discusses the serpent (or Satan) and his plan to deceive mankind and wash him away by blinded him to the Lord and his truth. Speech ends the song by stating his purpose, which is to spread the good news so others lives can be saved. Speech tastefully shares his Christian beliefs without sounding too preachy or judgmental. The instrumental will grown on you, then win you over after a few listens. People Everyday (Metamorphosis) – This was the remix that I mentioned early. The acoustic guitar sounds so much better than the backdrop on the original. They say never judge a book by its cover, but sometimes a record’s artwork will tell you exactly what you can expect as far as content. 3 Years is one of those albums. The album cover depicts Speech and company in the wilderness, decked out in a mix of African attire and hipster garb as Speech and Headliner look up to the heavens as if they’re praising God, while the rest of the crew looks to be in the mist of African dance with one waiving the African flag. Musically on 3 Years, AD combines African pride themes with hippy like philosophies and a touch of spiritual overtones, placed over backdrops that mesh traditional hip-hop with folk, blues, and African sounds. Speech (who’s style is a mix of Q-Tip and Prince B) has a lot to say and makes some strong points along the way but a large portion of the production is spotty and awkward, and will make even the most patient listener give up on listening to Speech’s, um, speeches. I could not get into these cats. I always lumped them in with the neo soul crowd. Here’s some history for you dee dub. Their debut was on Milwaukee based label camus records. A 12 inch titled Speed Limit 55/ H.S. Dis Saltine and Princess Plate of Biscuits and Gravy/ No Salt Added Plump Booty Jam released in 1989. Mediocre instrumental… XD! That’s funny, stop joking! Everything on that song was hot.